Home creative process Emily's Books imagination Do You Want You Want Your Fiction Writing to Expand Like Crazy? Do You Want You Want Your Fiction Writing to Expand Like Crazy? 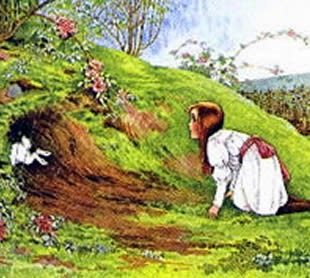 Falling Down the Rabbit Hole: Wonderland as Metaphor! Falling down the Rabbit Hole into Wonderland is a perfect metaphor for the creative journey which can never take place in the “real” or conscious world. Writing, whether it be fiction, poetry or nonfiction, finds its origins in the dark, fertile chaos of the unconscious. If you don’t meet Cheshire cats and Mad Hatters, Tweedledees and Tweedledums, mad queens, dragons, flying monkeys and monsters, or your version of the above, then you have not fallen. This is not to say you have to be writing fantasy or horror to open to your unconscious, but as you will see, the journey for the writer must hold metaphorically a good sprinkling of both.